54 Event cards invite you to (re) write Small World's history! 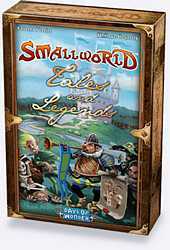 Small World - Tales and Legends was created by Laurent Verrier, Special Prize Winner of the Small World Design Contest. Philippe Keyaerts, the original game's author, provided additional development assistance. Small World - Tales and Legends introduces 54 new Event cards that change the storyline of each turn during the game. •54 large format Event cards, •1 Current Event & 1 Upcoming Event card, •1 Game Rules & 1 Variants card, •2 Blank cards to write your own Tales!